Children of Fiji is a charity that is registered both in the UK (No. 1082331) and in Fiji (No. 630). Its declared aim is to advance education, health and welfare, and to relieve poverty of children in Fiji. It has no political or religious affiliation and strives to help all children in need, irrespective of their gender, ability, ethnic origin, or religious belief. As part of our on-going programme we provide basic items for schools and kindergartens, such as relevant reading and reference material, stationery, games and equipment. We visit schools on the main islands and also on many of the smaller islands of Fiji. We also regularly provide resources for children’s homes and the children’s departments of hospitals. We have provided more specialist equipment, such as musical instruments, Braille machines, Braille reading material and appropriate tactile resources for the Fiji School for the Blind and shower chairs for use by the children in the Frank Hilton Special School and Hostel. We have provided large quantities of medical equipment (including weighing machines, Doppler machines, digital thermometers, dressings, sphygmomanometer, rubber gloves and baby items) for the Bouma Nursing Station on the island of Taveuni. We also provided backpacks, as the nurse and her team of volunteers have to trek into remote villages to monitor and treat patients. For the transport of goods to Fiji we would like to acknowledge the support of Qantas Airlines, Fiji Airways, Vanguard Shipping and Sopac Shipping . We also carry out a number of larger projects. For example we have funded the building and equipping of Sunny Smiles kindergartens at Bainivalu Primary School in Nakasi, at Naduri on Vanua Levu, at Narikoso on the island of Ono, at Nabukelevu-i-Ra on Kadavu and at Rukuruku on Ovalau. Since then we have built Sweet Smiles kindergartens (partly funded by Tate & Lyle Sugars UK) at Tabia on Vanua Levu and at Buruwa in the west of Viti Levu. We have provided outdoor play equipment at several kindergartens and also covered play areas at Kavanagasau and Korotari Arya Schools. We have provided science equipment at Nakasi High School and Dr Ram Lakhan Memorial School, and produced and equipped quiet activity areas in St Christopher’s Children’s Home and the C W M Hospital in Suva. We have also had a library constructed at Vatuwaqa School near Suva and a girls’ dormitory built at Navitilevu School (a project jointly funded by ‘Children of Fiji’ and the school). The dormitory at Waibunabuna School, where the children were sleeping on the floor, has been equipped with 50 beds. At Uluinakorovatu Primary School on Beqa we provided a kitchen/dining room and the necessary equipment to enable parents to cook regular hot lunches for the children attending the school. Our most ambitious project to date is to fund the construction of a vehicular bridge across the river at Qelemumu Primary School on the island of Vanua Levu. Previously, children had to wade through a very dangerous river to get to school. In the rainy season the river became too high to cross and the children sometimes missed weeks of school. Several children had drowned. The children now have a safe crossing and can even get to secondary school in Labasa by truck. 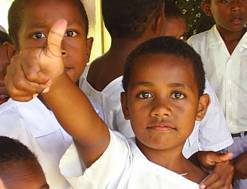 Only about a third of schools in Fiji have adequate fresh water and sanitation facilities. We have provided 12 schools with fresh water storage tanks and at Sigatoka Valley School we financed the drilling of a bore hole to obtain water. An even more ambitious project to provide fresh water at Navolau Primary School is now completed. This latter school is in a particularly dry area and water shortages meant that it often had to close. The project involved piping water from a source in the mountains about 9.5 kilometres away to storage facilities above the school. This project was funded in a three way split between the Fiji Government, Children of Fiji and the village itself. 2006 saw the completion of our second bridge. This footbridge is at Kaleli near Lautoka on the main island. It links two settlements across a creek and means that 500 children now have safe access to school instead of having to struggle through a dangerous flooded creek. We have provided Navitilevu District School with a fibreglass boat / outboard motor and 30 lifejackets to enable the safe transport of children between their villages and school (so they no longer have to swim across a bay! ), as well as giving rapid access to medical aid for the children. We have also provided a similar boat and lifejackets for the use of Rewa Secondary School and Nailili Primary School to enable children to attend school from islands in the vast Rewa River. We have seen at first hand the difference this is making with children now able to get to school regularly and safely. We have provided sanitation facilities for Ahmadiyya Secondary School on the island of Vanua Levu. This school is in a very rural area and there is no electricity available at present. We have installed electricity from solar power at Ahmadiyya School for the staff and students to use for lighting and for running some computers. Our second fresh water/sanitation project was completed in September 2008 at Rakiraki Primary School. Children at this school were previously suffering very poor health as a result of inadequate facilities. Some were showing early signs of trachoma, a condition that can lead to blindness if left untreated. We produced a worksheet on the importance of hygiene and that has been incorporated into the curriculum. Our 3rd sanitation project at Waibunabuna Primary School on the island of Vanua Levu was opened in March 2010 and our 4th at Kavanagasau is also now complete. (thanks to the generosity of Dorchester Middle School in Dorset, UK). We have provided sports equipment for schools, musical instruments for a Hindi Youth Group, 200 brightly coloured customised T- shirts for a Sunday School Group in one of the poorer areas of Suva and regularly deliver items for new born babies to rural hospitals and medical centres. One of the most exciting aspects of our charity work was being able to organise for a young girl to come over to the UK to undergo reconstructive surgery. The 14 year old girl suffered from a rare genetic condition known as ‘cherubism’, in which the bone in the face began to disintegrate at the age of about 5 years and replaced by tissue, leading to huge facial swellings. Surgeons in a private London hospital agreed to carry out the operations free of charge. Shayna came over with her mother in January 2008 and spent 7 months here, undergoing several stages of major surgical treatment including bone grafts. The surgery was very successful and the physical changes have been quite significant. Perhaps even more exciting, however, is the self assurance that she now possesses. She has returned to Fiji with the confidence to face the future with optimism. She now attends college and is thoroughly enjoying her new life (she rarely attended school before, as she was reluctant to leave her home because of the fear of being bullied or teased). In 2010 Shayna returned to the UK for the last part of her surgery and to have teeth fitted. We organised for 3 year old Pooja, who suffers from a severely underdeveloped jaw and virtually no tongue, to receive treatment in Melbourne, Australia. Pooja was unable to swallow or speak properly. Her breathing problems have now greatly improved and she is due to return to Melbourne for more surgery when she is older. Just recently we organised for a young boy to go to Hawaii to have surgery to enable him to be able to walk. The surgery was successful and he is now back in Fiji. In March 2014 we organised for 7-year old Samson to travel to India for surgery to treat his hole-in-the-heart condition. The treatment was not available in Fiji. The operation was a complete success and Samson is now fully recovered, back in Fiji and looking forward to leading a full and active life. We have responded to disasters and send out emergency supplies in response to cyclones and other natural disasters. In 2005 we were actually on hand to directly aid victims of flash flooding which destroyed many settlements and rendered many families homeless. We sent out emergency resources for victims of Hurricane Cliff and Cyclone Gene, and early in 2009 we set up an appeal and collected essential medical and other resources for victims of serious flooding in many areas of the country. We personally delivered these resources. In October 2010 we appealed for funds after the Hilton Early Intervention Centre was flooded, destroying carpets and equipment. As a result, we were able to have the whole area tiled. Following threats of flooding and cyclones, we donated water filter systems to the Disaster Management Council. In the wake of the cyclone Evan (Dec 2012), we launched an appeal to help those who have lost their homes and possessions. On February 20th 2016, Fiji suffered its worst ever cyclone. Tropical Cyclone Winston was the worst ever in the Southern Hemisphere and the second worst ever in the world. Devastation was widespread. We were there at the time and were able to help immediately with tarpaulins, water purification, mosquito nets, seeds and vitamins. This campaign continues as it will take many years for Fiji to recover. Over the last few years we have provided solar lights for around families with young children. These families are living in remote communities with no electricity. Inmates of HM Prison, Wakefield have translated children's books into Braille for us. This link between these prisoners and the blind children of Fiji is one which shows how people from opposite sides of the world can help each other. 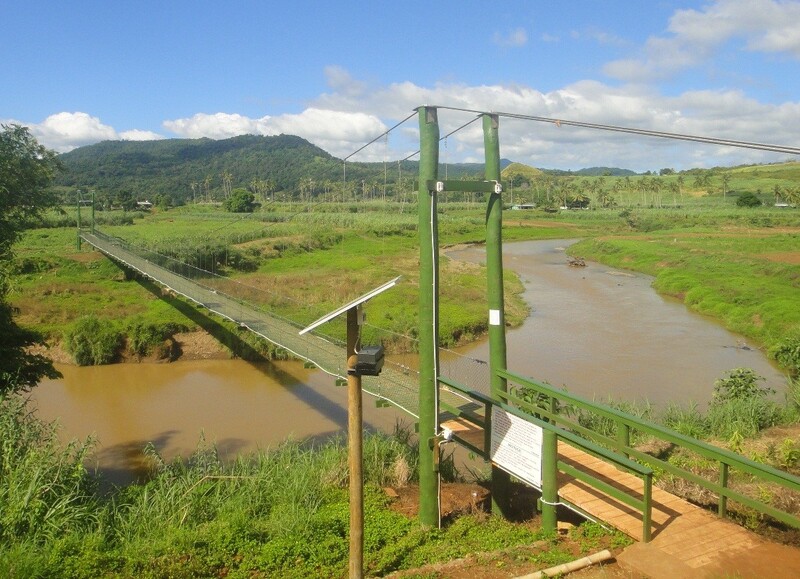 Our latest project is the construction of a 123 metre suspension bridge over the Korotari River (a joint project with the Government of Fiji to give children a safe access to school. We are pleased to report that this is now complete. As we have already indicated, Children of Fiji is run by just the two of us. We both took early retirement from teaching in the UK and run the charity full time, apart from 2 months each year when we mark A level examinations to earn the money for our own transport to Fiji and accommodation whilst there – we never use charity funds for this. We make two visits per year. Further information about Children of Fiji can be found on our website www.childrenoffiji.co.uk .